Today I can’t believe it! I weighed in and it showed a total loss (since July 1) of 27.0 pounds. We are just beginning week 6 of Eat to Live and I feel phenomenal! I have way more natural energy than I’ve ever had. I can’t say that my cravings are 100% gone, but they can be overcome. I have a GREAT coach with my daughter Amber, and a wonderful teammate in my husband Steve. This also marks the beginning of the 4th week of exercise. I am so much stronger than I have been in a while and my body is actually craving a good workout. I am doing things I never thought possible. Let me give you an example. Before, I would go to the gym and do water aerobics because with my weight, that is all that I thought I was capable of. Amber talked me into trying out the elliptical machine. First day, I set the timer for 20 minutes and thought I was going TO DIE! 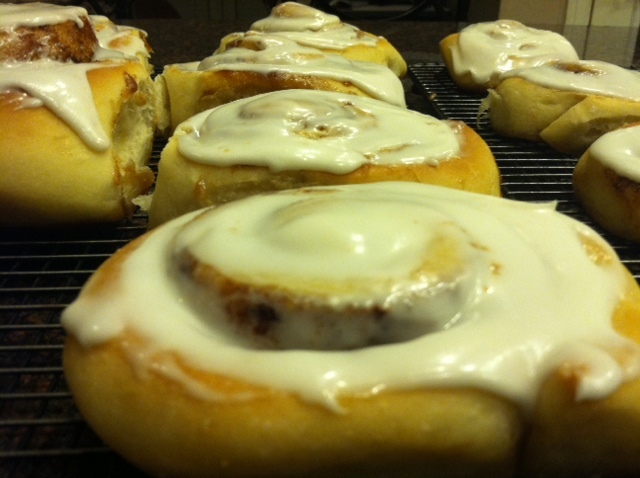 Now… I set the timer for 35 minutes and breeze through it. I actually had to move up the resistance a notch or two. This makes me feel so great in both mind and body. Today is the beginning of week 4 for me and my health journey. 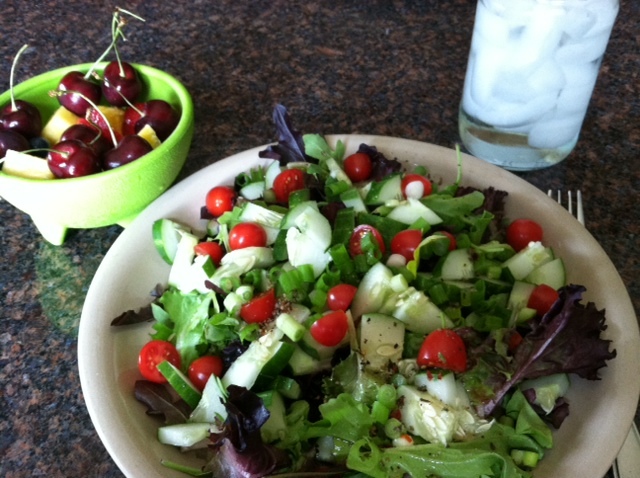 Steve and I began Eat to Live on July 1 (it is now July 22), and we have stuck to the program like glue! I am happy to report that I am feeling more and more energetic, more happy, have a clearer mind, and just an overall sense of well being. I do not feel cheated on what I get to eat, I feel liberated. My cravings for sweets are gone. 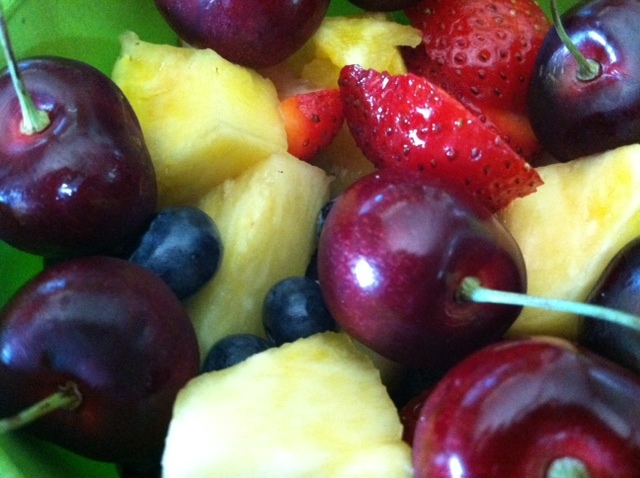 I fulfill that desire now with fresh fruit. We try to weigh every day, but count our weigh in on Sunday as the official. I am happy to report that my weight loss from July 1 is a solid 18 pounds! We have committed ourselves to 6 weeks of this program, yet I can see us carrying this further and further. Steve has lost 15 total. I would encourage everyone to read the book “Eat to Live” and follow its principles. I have committed myself to begin my exercise regimen this week as well. I am pleased to report my progress. I worked out on the elliptical machine at the Health and Wellness Center (no arms yet.. just my legs) on Monday, Tuesday and Friday. Each time, I went for a total of 20 minutes, on the lowest resistance setting. Furthermore, I went to the water aerobics morning class on Wednesday and Thursday. I rested on Saturday and walked one mile down our road and West Lake this morning. Ahhhhhh it is a challenge for me FOR SURE, but I feel so great after it’s all over! I am committing to 6 days again this coming week. Thank you for following my blog. It’s feeds my enthusiasm for this. I never expected to experience what I did. There was this amazing, and overpowering sweetness just oozing from the juice of the nectarine. It was almost as if I had never tasted anything so sweet or flavorful! It was sweeter than any chocolate, or candy, or cookie that I had eaten in the past. And the punch…. WOW!!! This health plan is something I plan on sticking to for the rest of my life! Fruit is the only candy that I need now. How I love eating lunch! 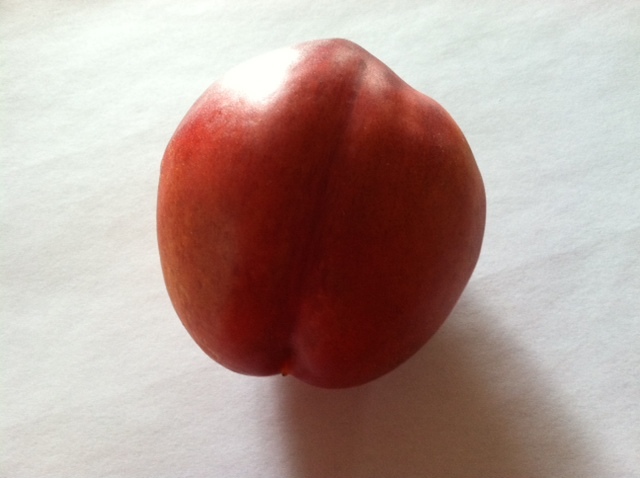 Every day I find what kind of pretty fruit I can have. Then I make a HUGE salad (hopefully with garden vegetables). I also make my own salad dressing. Today did not let me down. I have been exercising consistently every day this week. I am finding myself more and more hungry! But also, the food tastes more and more distinct. It’s just an overall GREAT experience. I suppose I need to talk about weight loss. I began this journey on July 1, 2012. Today is July 18, 2012. I weighed in for a total loss of 14.8 pounds since the beginning! YAY! It seems to be just falling off. This is getting FUN! This is momma Packard typing this. Today I wanted to share my enthusiasm for exercising. Oh boy, do I have a L-O-N-G way to go, yet it feels so good. I hadn’t exercised in quite a while and today was THE DAY! I decided that since I was already making a trip to Beaumont to take Dallin to tutorials, then there was no other choice but to exercise while I was waiting for him. I actually own a nice expensive membership to a top class gym in the area. My regret is that I haven’t used it in a while. I promised myself that I would exercise strong for at least 20 minutes. Amber told me about the elliptical machine and encouraged me to give it a shot. So, I got on that machine. I opted for the one where you DON’T use your arms. I needed to focus and start small. You see, I’m 44 and quite (and I mean that VERY strongly) overweight. So, this was indeed a challenge for me. I started on that machine and immediately thought, “Oh my goodness, I hope I can make it 5 mintues.” Then I made it five and the going got a little easier. And a little easier, and even a little easier. I certainly huffed and puffed a plenty, and drenched my shirt a good one, but I MADE IT 20 MINUTES!! Yes… 20 WHOLE minutes. The endorphin rush came just as I had remembered… yes it is all worth it. PLUS it gave me energy for the rest of the day. To top off the day… my sweet husband and I went for a walk around our neighborhood. One mile. Ahhhhhh life is good!! Well, I made the plunge. 16 days into the new lifestyle change, and I’m beginning my exercise regimen. I have been dreading this part, although I don’t know why. I have always loved exercising. 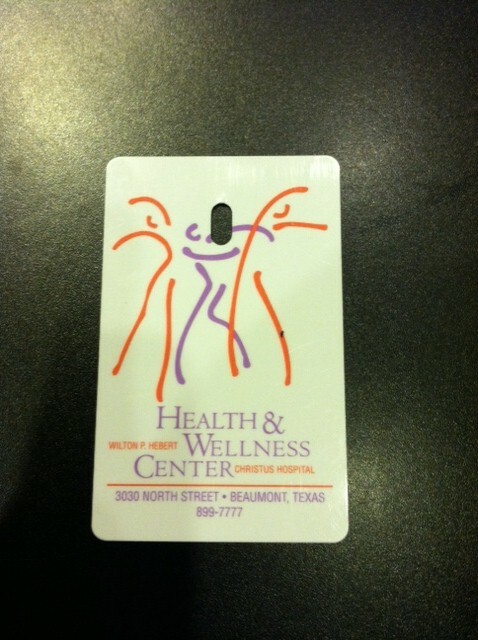 I became a member of the Health and Wellness Center last July and began with water aerobics. Oh, I LOVED that class. It was just hard finding the right time to fit with the class. So, I quit going after the new year came (2012). I decided that I’ve been into this health kick long enough, that it HAD to include exercise. Back in the day, I was a BIG time exerciser and did all sorts of exercising. Slowly, as the weight packed on, it became harder and harder to do the things I used to do. So, I quit. I TOTALLY forgot the endorphin rush that comes with exercising. All I remembered was the pain. Plus, I’m a bit older now and the body just feels things a bit harder than it used to. Amber has been begging me and begging me to get started… to do something…anything. I would always find an excuse. It’s even hard for me to walk to my mailbox and back (granted… the mailbox is a good 1/10 of a mile out there… but still!). So, today is the day. I promised Amber, and myself, that I would somehow exercise. I had to get Dallin to tutorials in Beaumont at 10:00 and the water aerobic class is over at 9:00 so that wouldn’t work. I decided that since I was in Beaumont already, I would work out on the elliptical machine at the Wellness Center. Okay, I haven’t done those is FOREVER. Amber said…. 20 minutes or it doesn’t count. So I decided to give it a shot. Oh my goodness, I thought I was going to die! The first few minutes I kept thinking… maybe I will only go 5 minutes today. I began breathing HARD and sweating. But, I decided to keep on keepin on. I actually MADE it the whole 20 minutes. And you know what? It felt absolutely marvelous. Endorphin rush and all! I think I can keep this up. I am going to try and go on a walk with Steve tonight (if it ever stops raining!) and maybe this time we will walk all the way down WestLake and back. Oh, and here is picture of my lunch. 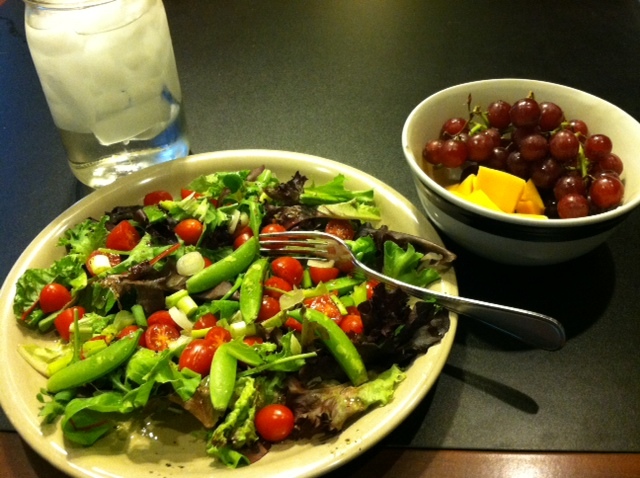 I am REALLY enjoying all of the fresh fruits and vegetables! WOW!! Kick off to a new me! This is a blog meant to inspire myself when on this journey. You see, I am an overweight mother of 5, a happy wife, and a 7th grade teacher of English. Through the years, unfortunately, through our passion for life and food, my husband and I have become somewhat overweight. Me… a LOT… him… somewhat. We LOVE the kitchen and creating food for our loved ones. Steve, my husband, has become somewhat obsessed with making the best of the best food imaginable. In his endeavor, he (and I) have put on quite a few pounds. Recently our daughter Amber came up with a plan. She encouraged us to check into “Eat to Live” by Dr. Fuhrman. I was a bit skeptical. She even devised a plan, a lottery of sorts, to keep us on track. We would begin this new lifestyle on July 1, 2012 and continue for 6 weeks. At the end of 6 weeks, we would determine who the winner was, and disperse the funds. Amber knew she had to end a week earlier, so she began a week earlier. Well, Amber… the twig of a girl that she is, found out that this was not exactly meant for her body type. She quickly bowed out. Steve and I on the other hand, determined to stick it out. I was still a little uneasy about the whole thing, but figured I would go along with it for fun. July 1 came and we began. We went to Sam’s and bought all sorts of YUMMY and DELICIOUS produce, and made sure we had a stock of beans and brown rice. Well, a spontaneous trip to Utah took Steve away, and the younger two boys (Dallin and Samuel) went off to EFY in San Antonio. That left me alone in the house for 4 days! No one would even know if I was cheating or not! I began texting my pictures of what I ate to Amber. She in turn would encourage me. It just became a fun game for me (even without the initial lottery we had planned). I would get a rush, just sending those pictures to Amber and seeing her response. My goodness! I did not expect to start feeling so terrific so soon! This diet, or health plan if you will, was just infectious. I began posting pictures on facebook, and BAM! I got tremendous response. Amber insisted that I start blogging about my journey, and posting pictures and recipes. I am BRAND NEW to blogging, and I don’t know my way around just yet. I won’t bore everyone with the fine details just yet. I will add them as I go. But for now, WELCOME to my wonderful health journey. This is day 13 for me. 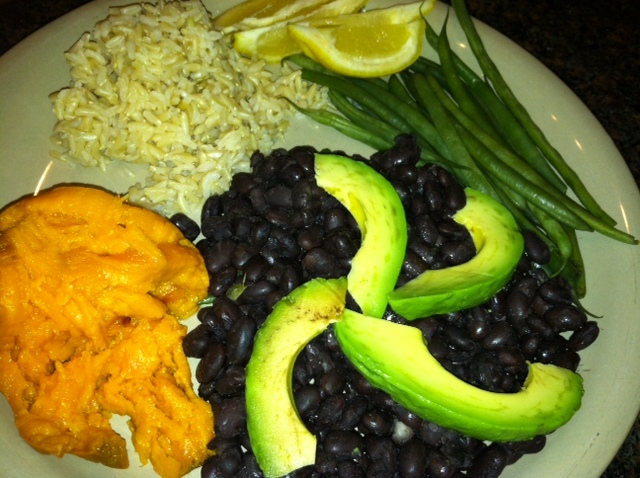 My diet is completely vegan, and I am completely satisfied. I can’t believe I am saying this, because my biggest weakness has been my sweet tooth. With all of the fruit that I eat, I don’t miss sweets one bit! 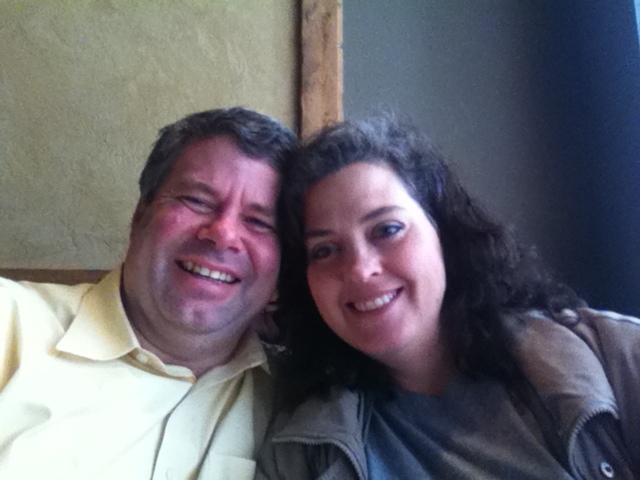 Okay, for tonight, I will post a picture of my husband and I at a Valentine’s lunch. Also I will post tonight’s dinner. I promise to post recipes as we make them. I will learn more about blogging and make this more interesting as the time comes along as well. Here goes nothing!